The global personal care ingredients market is teeming with players of different sizes owing to low entry barriers. This makes the market not just fragmented but also highly competitive. In such a cutthroat environment, the multinational companies lead owing to the greater resources they command. Nevertheless, the regional players are giving them stiff competition. At the forefront of driving the global personal care ingredients market is the high spending capacity of people worldwide which has driven up demand for personal care products. Besides, availability of a range of products owing to constant thrust of companies on innovation has also had a positive impact on the market. For example, consumers’ newfound penchant for organic products formulated with natural ingredients, sans chemical additives, has opened up new growth avenues for players in the global personal care ingredients market. Posing a challenge to the global personal care ingredients market are the strict rules pertaining to the usage of certain products. Several regulations have been placed against numerous personal care ingredients in Europe and North America. A report on the global personal care ingredients market finds that its revenue would rise at a steady 5.2% CAGR between 2015 and 2023. Expanding at this pace, the market is set to attain a value of US$11.76 bn by 2023 from US$8.19 bn by 2016-end. Based on applications, the global personal care ingredients market can be segmented into hair care, skin care, cosmetics, oral care, and others. The TMR report projects the skin care products ingredients to account for 33.1% share in the global personal care ingredients market by 2023. Those typically comprise of ingredients for formulating baby care products, hand lotions, creams, sprays, and body lotions. Demand for such ingredients is not just restricted to volume but also quality. In addition to skin care products, the hair care products are also seeing great demand in the global personal care ingredients market. In the U.S., for example, there is solid demand for conditioning polymers. Further, efforts by players to launch better hair care products touting various USPs is also having a positive impact on the market. Another application segment that is spelling promise in the global personal care ingredients market is the oral care products. It trails the hair care and skin care products with respect to demand generation. From a geographical standpoint, the global personal care ingredients market is spread across North America, South America, Europe, Asia Pacific, and the Middle East and Africa. Among them, Asia Pacific has emerged as the most lucrative market. This is because of the large population in the region. It is said that China and India account for two thirds of the world population. In addition, the nation’s economies are also the fastest growing in the world. This has created a massive demand for personal care products in the region thereby fuelling the personal care ingredients market. Reduced labor and land cost has also served to bring down manufacturing costs in the region. This is another factor boosting the global personal care ingredients market. The TMR report finds that the Asia Pacific personal care ingredients market would likely attain a value of US$4.07 bn by 2023-end. Some of the key players in the global personal care ingredients market are BASF SE, Evonik, and Akzo Nobel N.V. This report analyzes and forecasts the personal care ingredients market on the global and regional level. The study provides historic data of 2014 along with forecast from 2015 to 2023 based on volume (kilo tons) and revenue (US$ Mn). The study provides a decisive view of the personal care ingredients market by dividing it into product, application, and regional segments. Product and application segments have been analyzed based on current trends and future potential. The market has been estimated from 2015 to 2023 in terms of volume (kilo tons) and revenue (US$ Mn). Regional segmentation includes current and forecast demand for North America, Europe, Rest of Asia Pacific, Latin America, and Middle East & Africa. These regions have been further sub-segmented into countries and sub-regions with relevance to the market. Segmentation also includes demand for individual product type and applications in all the regions. The study covers drivers and restraints governing the dynamics of the market along with their impact on demand during the forecast period. Additionally, the report comprises opportunities in the personal care ingredients market on the global and regional level. The report includes detailed value chain analysis to provide a comprehensive view of the personal care ingredients market. Analysis of Porter’s Five Forces model has also been included to help understand the competitive landscape in the market. The study encompasses market attractiveness analysis, wherein applications have been benchmarked based on their market size, growth rate, and general attractiveness for future growth. The market has been forecast based on constant currency rates. Prices of personal care ingredients vary in each region and are a result of the demand-supply scenario in the region. Hence, a similar volume-to-revenue ratio does not follow for each individual region. Individual pricing of personal care ingredients for each application has been taken into account while estimating and forecasting market revenue on the global level. Regional average price has been considered while breaking down the market into application segments in each region. The report provides the size of the personal care ingredients market in 2014 and the forecast for the next nine years. Size of the global personal care ingredients market has been provided in terms of volume and revenue. Market volume has been defined in kilo tons, while market revenue for regions is in US$ Mn. Market size and forecast for each product segment has been provided in the context of global and regional markets. Numbers provided in the report are derived based on demand generated from different applications and types of raw materials. Market dynamics prevalent in North America and Europe have been taken into account for estimating growth of the global market. Market estimates for this study have been based on volume, with revenue being derived through regional pricing trends. Prices of commonly utilized grades of personal care ingredients in each application have been considered, and customized product pricing has not been included. Demand for personal care ingredients has been derived by analyzing the global and regional demand for personal care ingredients in each application. 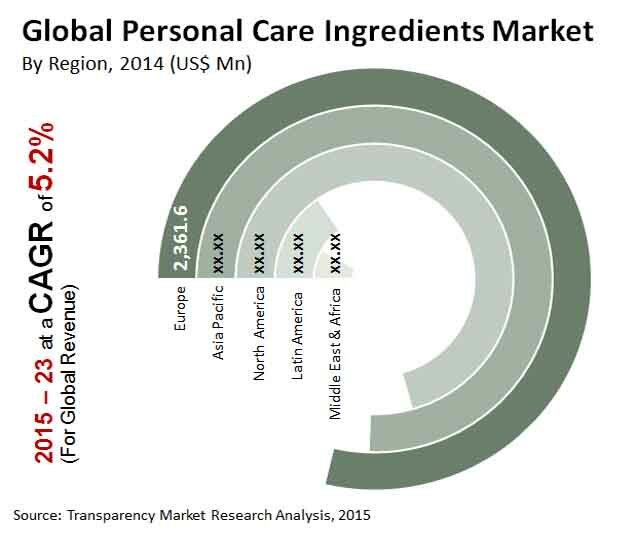 The global personal care ingredients market has been analyzed based on expected demand. Market data for each segment is based on volume and corresponding revenue. Prices considered for calculation of revenue are average regional prices obtained through primary quotes from numerous regional suppliers, distributors, and direct selling regional producers based on manufacturers’ feedback and application requirement. Forecasts have been based on expected demand in personal care ingredients applications. The global product segment and application split of the market has been derived using the bottom-up approach, which is cumulative of each region’s demand. Regional demand is the summation of sub-regions and countries in the region. Companies were considered for market share analysis based on their product portfolio, revenue, and manufacturing capacity. In absence of specific data related to sales of personal care ingredients by several privately held companies, calculated assumptions have been made in view of companies’ product portfolio and regional presence along with demand for products in their portfolio. The report covers detailed competitive outlook that includes market share and profiles of key players operating in the global market. Key players include BASF SE, Evonik, Akzo Nobel N.V., Ashland, Dow Corning Corporation, Lonza Group Ltd., Croda International Plc, Wacker Chemie AG, and Clariant. Company profiles comprise attributes such as company overview, brand overview, financial overview (in terms of financial year), business strategies, and recent/key developments.